What a great theme for this convention. The Red and White portion refers to the obvious patriotic reference to the nation’s flag reminding us of the freedoms granted to all American citizens. One of those freedoms, the right to a free and unfettered press, has become an expectation often taken for granted — but not this weekend. Not at this national convention. Not with the more than 5,000 delegates who know the freedom of an unfettered press comes with an equally important responsibility. If we are to be part of the free press we must guarantee it is also a True press. Our mission as journalists is to find and present facts fairly and fully so those who depend on our media can find truth. What better place to pursue that mission than the nation’s capital where there is so much truth to explore. Your pursuit might take you past the U.S. Supreme Court Building where student journalists were guaranteed First Amendment rights in the 1969 Tinker v. Des Moines Independent Community School District case and where those rights were diminished with the 1988 Hazelwood School District v. Kuhlmeier decision. Your pursuit can also take you by the National Archives building on the National Mall where you could see the real document, the Bill of Rights, the first 10 amendments to the U.S. Constitution. And guess what. Our amendment is No. 1 — not four or seven or eight — it’s No. 1, because the founding fathers singled out the press and free expression as being important cornerstones of our democracy. In this monumental city you are certain to be inspired by the memorials to those who had great vision and were willing to make great sacrifices to see them become reality. Whether you stroll the Mall, tour the White House, stop in to see your senator, visit the National Zoo or browse a different museum every day, history and heritage surround you. But that’s not all. 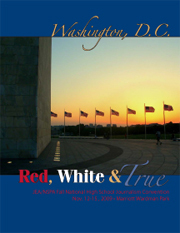 The D.C. Convention committee has designed a program with you in mind. You’ll find it hard to separate learning from fun. More than 360 breakout sessions, issue seminars on Marriage Equity, Covering Health Issues and Covering the Unthinkable, are certain to provide you with information and new ideas to keep your publications on the cutting edge for the rest of the year. We hope you’ll take advantage of visiting with media professionals at Break with a Pro and that you will exchange ideas and publications at the Friday night Swap Shops. Student dances will entertain you and on-site competitions will challenge you. It’s a convention packed about as full as we could make it. There are 24 featured speakers and instructional strands for every topic from cartooning to photography to writing to leadership. This comprehensive instructional lineup certainly has something for everyone. This weekend in Washington, D.C., we invite you to discover, to learn, to make friends and memories, to celebrate and to find your own Red, White & True.